Today, after being elected officers, we learned what we will be doing in the upcoming year. 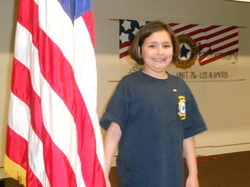 Amy Armstong, was elected as Junior President. Myself, Cassidy Griffin, was elected First Vice President. Miss Hannah Janji was elected Second Vice- President. 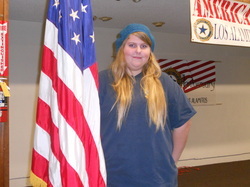 Amy Puhl was elected Secretary. Susie Mirzazadeh was elected Treasurer. And Samantha Garcia elected Sergeant-at-arms. Every May, poppy month, in our legion we put up a banner showing that it is poppy month. This year the theme is music and we put up a banner with the lyrics of an orginal poppy song, Poppys Carry On, made in 1932. Our banner this year is the lyrics of the song, and to raise money every donor is given a music note to put their name on it. Then, we put it on the lyrics that is already written on the banner. Every penny raised is sent to disabled vets and their families. Alright thanks for reading. Remember always respect your vets! Does technology effect the way the military thinks of home? I am thankful for our brave troops who risk their lives for us! 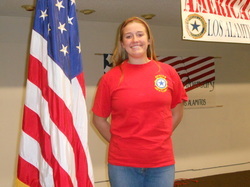 Why should you join the American Legion Junior Auxiliary? The American Legion helps soldiers by helping us win the war for freedom from terrorism. Not just that but we honor our veterans who have helped us in the past wars. We send care packages to the soldiers overseas and we write letters to soldiers to comfort them the most we can. The American flag is amazing. I see it waving at school, in front of businesses, at baseball games, even in my front yard, always flying in the air so gracefully. Red, white and blue, 13 stripes, and 50 stars, wow, it is beautiful. The American flag is also a symbol of what makes America the greatest country on earth. Many Americans died for our flag so we could have liberty, peace and justice for all. For this, I am blessed each time I recite the Pledge of Allegiance. This is what the American flag means to me. God Bless America! Cassidy- (8th grade): This is my fourth year as a Junior Auxiliary. 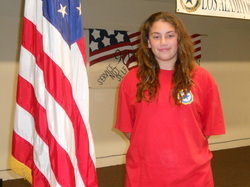 I joined the Juniors program to be more involved with our military and community. Samantha- (4th grade): This is my first year as a Junior. I have only been a member for a few months. I came to the Junior Jamboree and joined that day. I feel I am making more of a difference in people's lives than through any other organization I have been involved in. Amy- (11th grade): I have been a Junior Auxiliary member for over 16 years. I have always been involved in military and community projects as a Junior. I am able to give so much back to my community through the Juniors program. I encourage more girls to be involved with us. We are making a difference in our community. 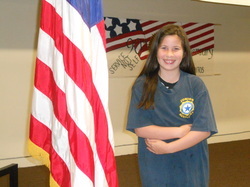 Susie- (4th grade): I just became a member at the Junior Jamboree in October. I loved the hands on projects we get to be involved in. We plan our activities and raise money for projects we want to help. I am learning so much about working together with my peers. It's a lot of fun. Hannah - (6th grade): This is my third year as a Junior Auxiliary member. I love being a part of this organization because we are so involved with our military and Veterans. It is a great place to learn about how great America is and to be able to work on volunteer projects that help make a difference to our community.